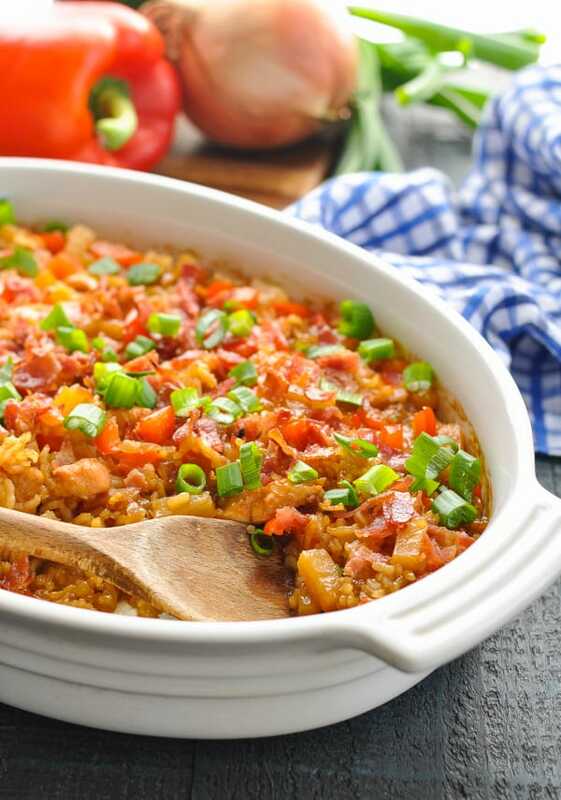 This Dump-and-Bake Aloha Chicken and Rice is an entire dinner that cooks in one dish! 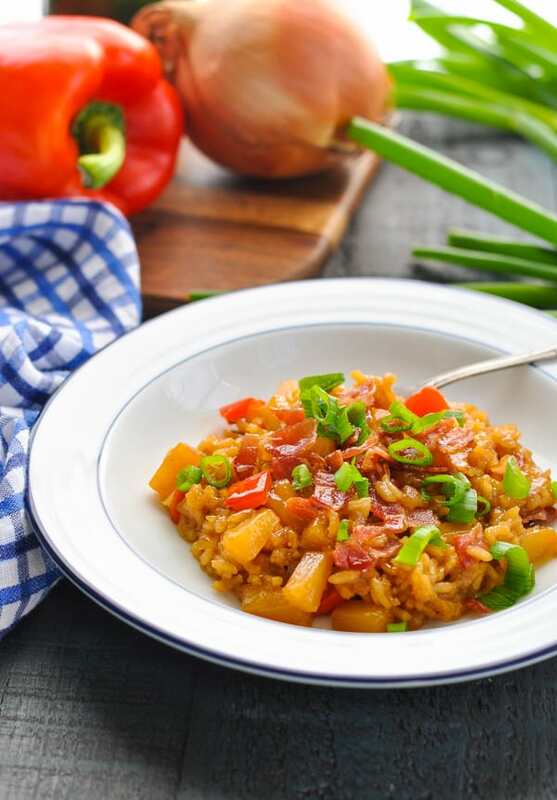 With just 10 minutes of prep you can stir together uncooked rice, raw chicken, and a sweet-and-savory sauce that's finished with crispy bacon. 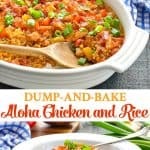 This Dump-and-Bake Aloha Chicken and Rice is an entire dinner that cooks in one dish! 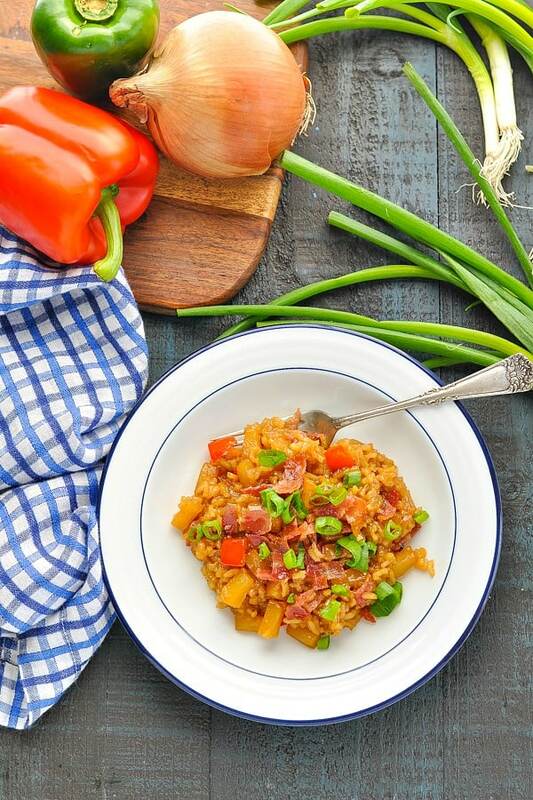 With just 10 minutes of prep you can stir together uncooked rice, raw chicken, and a sweet-and-savory sauce that’s finished with crispy bacon. 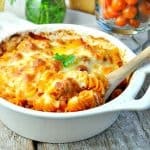 It’s an easy weeknight meal that the entire family will love! 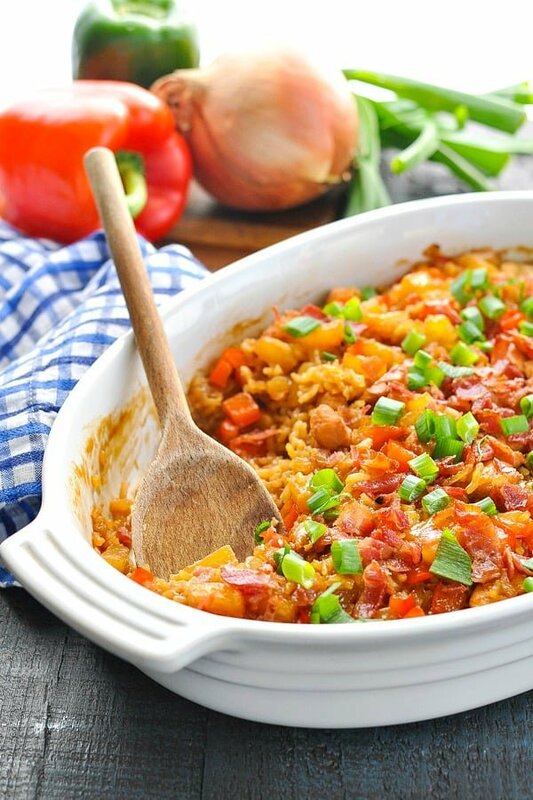 This Aloha Chicken and Rice brings together so many of my favorites in one meal — it’s no wonder that the supper has become a regular on our family table! You seriously can’t go wrong with a meal that involves almost ZERO prep work. You don’t have to boil the rice, you don’t have to pre-cook the chicken, and you don’t have to monitor or stir a skillet. Plus, there’s only one dish to wash at the end! Just whisk together a sweet-and-sour sauce, chop up a bell pepper, and dinner is practically done. 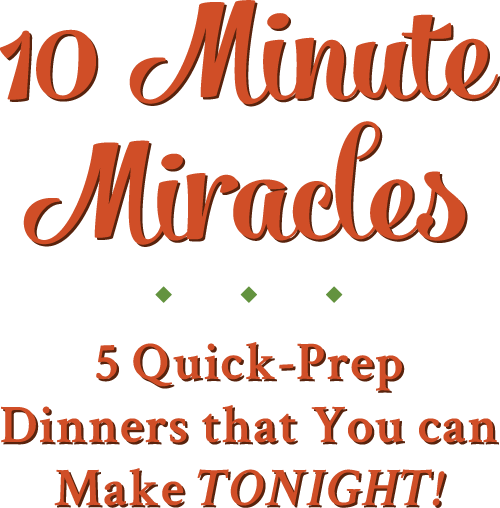 The raw ingredients all cook together in the oven for the ultimate EASY weeknight dinner! Let’s start with the sauce. You’ll need soy sauce, chicken broth, garlic, and brown sugar. Sounds good already, right?! 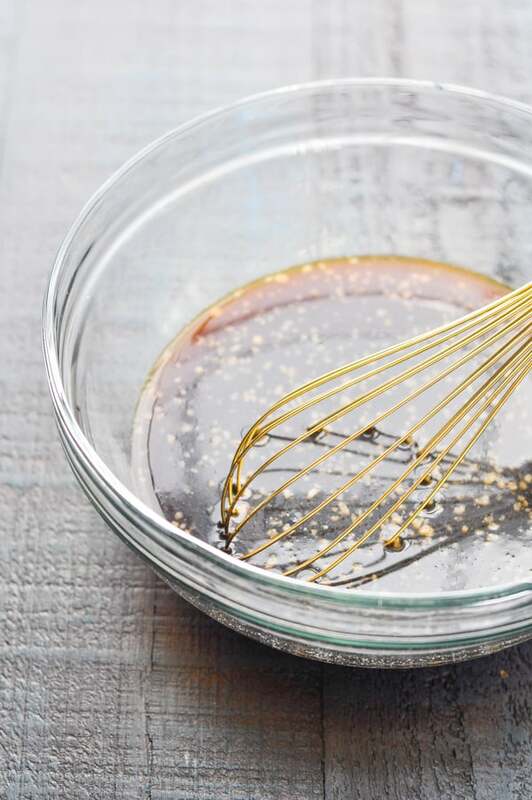 Whisk together the sauce in your baking dish or in a separate glass bowl. 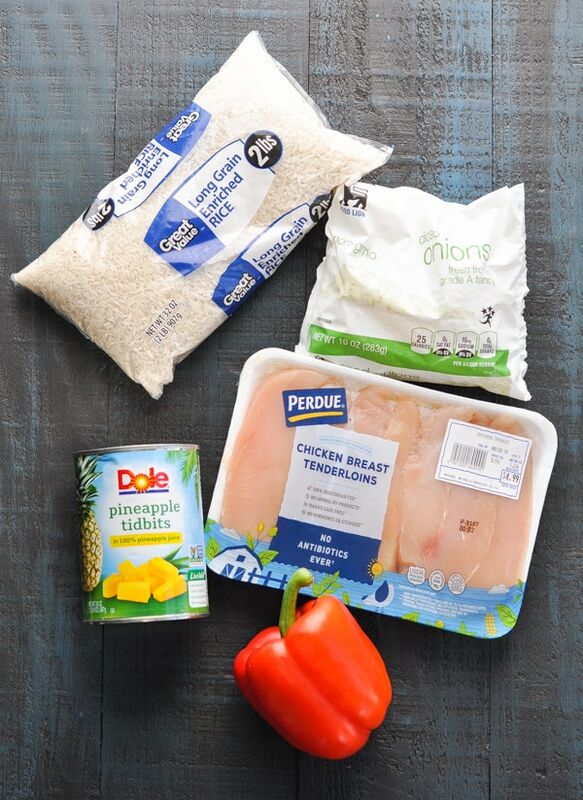 Now it’s time to add the rest of the ingredients for your Aloha Chicken and Rice. You’ll need long grain white rice, diced onion (I use frozen pre-diced onion for a shortcut, but fresh onion is fine too), chicken breast, a can of pineapple tidbits, and a red bell pepper. Stir these raw ingredients into the sauce. You don’t need to pre-cook the rice or pre-cook the chicken. Just dump it all into the bowl! 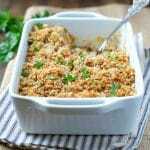 Transfer the mixture to a 9 x 13-inch casserole dish, cover tightly with foil, and bake in a 425-degree F oven for 55 minutes. I know that it looks like a lot of liquid, but the rice will absorb most of this sauce by the end! After 55 minutes, remove the foil cover from the dish, stir everything together, and sprinkle chopped, cooked bacon on top. 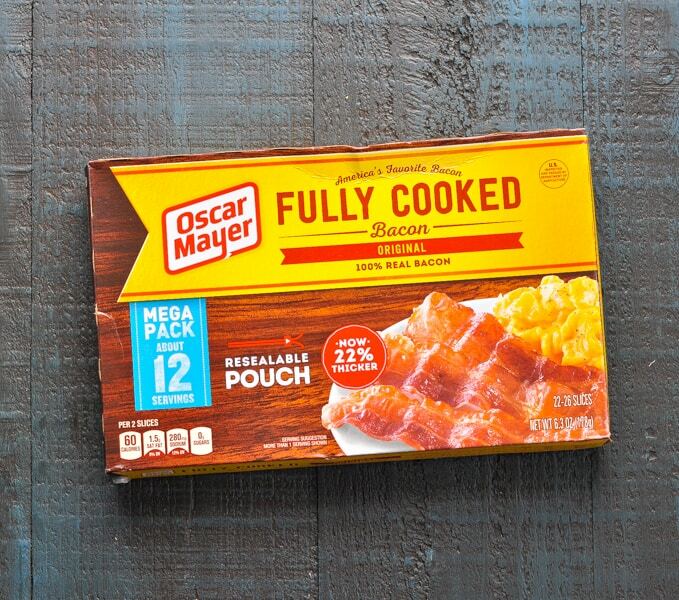 I use a package of fully cooked bacon for a shortcut, but you can cook your own bacon at home if you prefer. The dish goes back in the oven (uncovered) for about 5-10 more minutes. This will give the bacon a few minutes to get crispy, and it will allow the sauce to thicken. As the chicken and rice rests for about 5 minutes before serving, the sauce will thicken even more. When it’s done, there will hardly be any liquid left in the dish and it will just be a nice, thick combination of tender rice, juicy chicken, and flavorful fruit and veggies! If you prefer to use brown rice instead of white rice, that will work fine. You will need to increase the baking time to at least 90 minutes, though. This may cause the chicken to dry out slightly, but the recipe will still work. 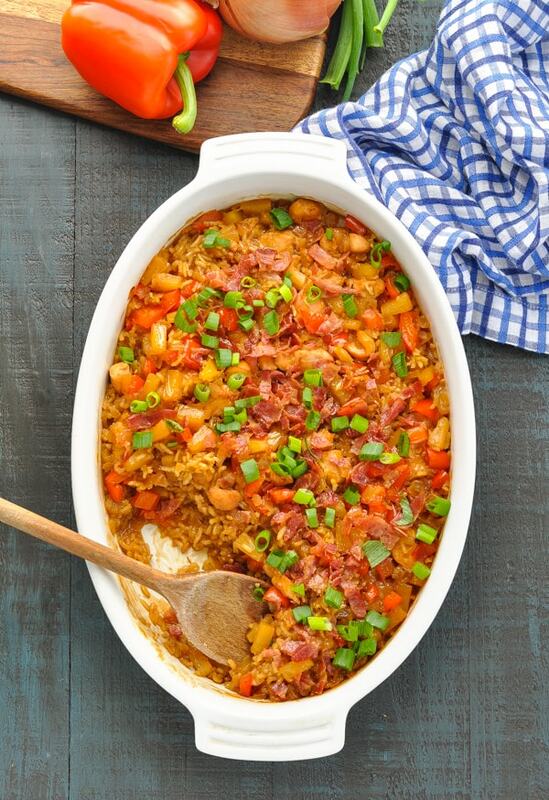 Try topping your finished casserole with sliced or chopped peanuts or almonds. That extra salty crunch adds a nice touch to the dish! Make sure to cover your dish tightly with foil so that none of the liquid or steam escapes during cooking. The rice needs that liquid to absorb while it bakes. If you would rather use fully cooked chicken instead of raw chicken, that will work fine! Just stir in the cooked chicken during the final 10 minutes of baking time (at the same time that you add the bacon on top). This will give the chicken time to heat through without drying it out. I called this dinner “Aloha Chicken” because of the combination of pineapple, soy sauce, and crispy bacon. It’s practically sunshine on a plate! While I might not be jet-setting to Maui any time soon, I can at least savor the tropical flavors and dream of clear blue ocean water as I enjoy another homemade dinner with my family. Hey, with a meal that’s so simple and stress-free, you just might feel like you’re on vacation, too! In the prepared dish (or in a separate bowl) whisk together brown sugar, soy sauce, garlic, and chicken broth. Add uncooked rice, onion, bell pepper, pineapple (with its juice), and raw chicken. Cover dish tightly with foil. Bake for 55 minutes. Uncover and give it all a stir. Return the dish to the oven, uncovered, and bake for an additional 5-10 minutes, or until bacon is crispy and sauce has thickened. Let stand 5 minutes before serving (the sauce will continue to thicken as it sits). Garnish with chopped green onions. This post was originally published in June, 2017. It was updated in January, 2019. I just love the name of the dish! Makes it sound so bright and cherry haha. And I love the flavors too…definitely what I need for more easy meals! Wonderful! I’m so glad that you enjoyed it, Jason! 🙂 Thanks for letting me know! This would have so much flavour! I love anything with pineapple so I think we’ll have to try this soon! I have a fresh pineapple I’ve been needing to use. This recipe sounds so great, but I won’t have the juice form the can. Could I substitute something for it? Hi, Stephanie! That should work fine! I would just add a splash of fruit juice (do you have orange juice or something similar in the refrigerator)? I’d use about 1/4 cup of the juice. 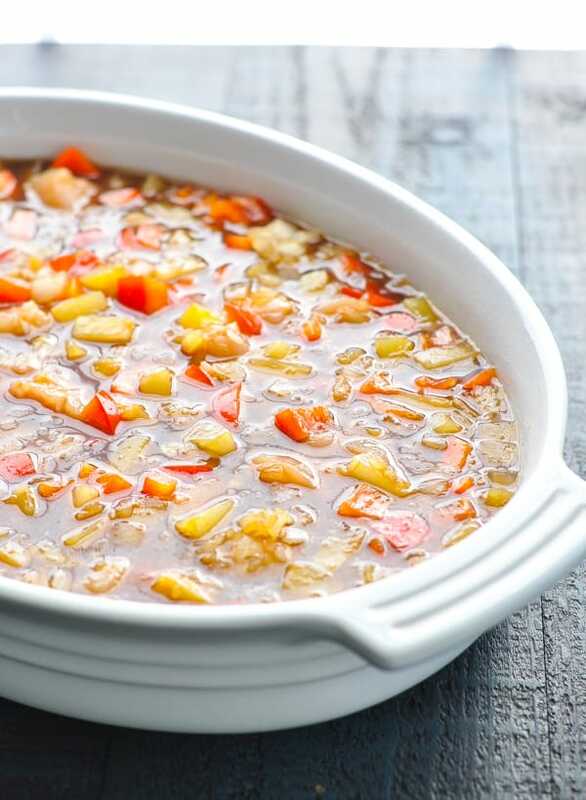 If you don’t have any fruit juice, then you can try about 1/4 cup of chicken broth or other liquid — it just won’t be as sweet as the pineapple juice. Hope that helps! Making this tonight for dinner, I added a little teriyaki sauce and used instant brown rice! I’m thinking of just serving it with a side salad since it has so many other components. My husband LOVES anything with rice. I can’t wait to taste it, my kitchen smells delicious! I also added a tiny dash of red pepper flakes. This looks so good! Although I couldn’t find lite soy sauce, any idea if I can substitute with regular soy sauce and if I should adjust the quantity? Hi, Stephanie! No worries — the regular soy sauce will work perfectly. The lite soy sauce is just lower in sodium, but you can use an equal amount of the regular without any problem. Enjoy! I used regular soy sauce and found it extremely salty. Next time I would try to get the lite. I have regular rice, so I cooked it first, which worked fine except there was a lot of extra liquid when it was done. If you do it that way, I’d cut the liquid by half. Still tasted good, however. I also only had half a bell pepper, so I tossed in some leftover corn and broccoli to make up for it. The bacon was a nice touch, perfect compliment to the sweetness from the pineapple. I’d definitely make this again. Hi, Tami! Thanks for that note — it’s helpful to know that the cooked rice worked well, too. Yes, you will definitely need to decrease liquid with cooked rice since it doesn’t absorb the liquid in the same way that the uncooked rice does. Again, glad that you enjoyed the flavors and thanks so much for letting me know! Made this tonight and loved it. Granted I cooked mine on the stovetop in a large cast iron, used 1 full cup long grain rice, added 2 Tbsp cider vinegar and a few dashes of red pepper flakes. Kept the liquids the same and didn’t add the veg until last 10 min of cooking. It turned out perfectly. Thanks for a keeper! Kris, I’m so glad that you enjoyed it! 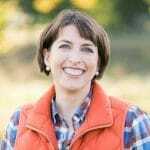 Thank you very much for sharing your changes — I know that other folks will find that helpful! Has anyone tried this with quinoa? Let me try this again. Has anyone tried this with quinoa? What adjustments did you make? I did make it with quinoa since it was the grain I had on hand. I used extra liquid to match the amount needed according to the packaging. It was something like 3/4 cup soy sauce and 1 cup broth. Figuring it was 1/2 cup liquid in the pineapple. It worked took at least an hour if not a little longer. Sounds great! Thanks for letting me know, Erin! Would you change the cooking time if you were to double the recipe? I made this tonight, followed the recipe exactly and in a 9×13 inch dish…it made a lot and was delicious! Absolutely, Marsha! That’s often what I use! 🙂 Enjoy! I made this tonight in a rice cooker with regular rice instead of instant rice. I also used spam instead of chicken/bacon because SPAM. My family likes leftovers for lunch and for meals on weekends (so I don’t have to cook!). I used 2 cans of Spam (again, SPAM!) and pan fried them first. Threw it in the rice cooker. Cut up a large onion, 2 bell peppers and added the pineapple from some pineapple chunks to the rice cooker (reserving the juice). I put in 4 cups of dry white rice). Put the juice from the pineapple in a measuring cup and added 1 cup brown sugar, 1 cup low sodium soy sauce and 4 cups of chicken broth, which yielded 6.5 cups liquid. Dumped it in the rice cooker and voila! It cooked up wonderfully. Rice was tender, but not mushy, and rice absorbed just enough liquid to leave the rice “creamy.” So YUMMY! Just sliced some green onions and it was fantastic! Made a HUGE rice cooker full – so plenty of leftovers. Thanks!!! Hi, Mimi! You’re a genius! Thanks so much for sharing your adaptation! I would have never thought to use my rice cooker for a full meal like this, but I’m glad that it worked well and that you enjoyed the flavors. Thanks again for taking the time to let us know! Perfect! That sounds great, Ashley! I’m glad that you enjoyed it! My wife got some boneless skinless chicken breast but no side dishes to go along with it, and she said to do what ever I wanted to do with it. I wanted to do something different something we never had before, and to tell you the truth I’m kind of burnt out on BBQ chicken and I didn’t know what else to do with it until i saw this recipe. When I saw this recipe I said to myself wow this sounds really good and easy to make so I tried it, and I’m glad I did because this dish was freaking awesome. Anyways I just wanted to say thank you and I will definitely be making this dish again in the future. Awesome, Jesse! I’m so glad that you enjoyed it! 🙂 Thanks for letting me know! Hi, can I use water instead of broth? If I don’t want to use soy sauce, should I change anything else? Hi, Elsa! If you leave out the soy sauce, it will significantly change the taste of the entire dish. The soy sauce adds savory, salty, umami flavor to the sauce that the rice cooks in. 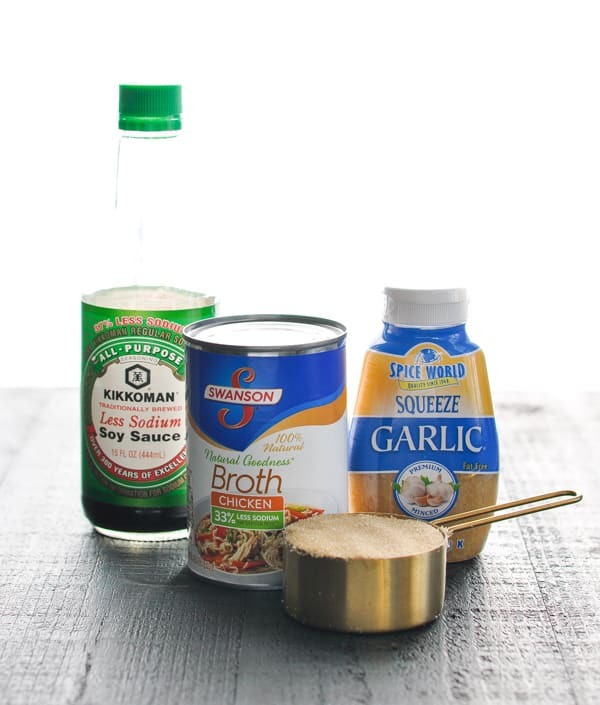 You will need to replace the 1/2 cup of soy sauce with some other liquid, so you might try tamari sauce or coconut aminos. Again, it won’t be quite the same, but it would be better than just leaving it out altogether. Hope that helps! I have been making and storing freezer meals for the winter lately (like a squirrel, ha!). Does this work well as a freezer meal? Hi, Sarah! I love stocking up on freezer meals! Hi, Diana! I think it would be *okay,* but I would worry about the rice absorbing some liquid and then having a bit of a mushier texture when it’s done baking. I don’t think it would be awful or inedible, just not ideal. I really enjoyed this recipe. I have a two week old and needed to whip something up for dinner quickly in between feedings and this was perfect. I had to bake the chicken for an additional 10 minutes, but it turned out well. My mother was visiting and really liked it, too. I’ll be making this again, thanks for the recipe! I followed the recipe exactly (well, not exactly – husband does not like garlic), and it was a success. When people go back for 2nd’s, you know it is good. That’s great, Mary! Thanks for letting us know. I’m so glad that it was a hit! Uh oh. I just went to stir and set for the last ten minutes and realized I never covered it. I also cooked in a 9×13 dish. Guess we’ll find out how it goes! It was a dark in color due to the lack of cover, but still a hit. I love love you pictures and can’t wait to try this recipe. Thanks. Did anyone figure out how long to bake for instant brown rice? Hi, Linda! No, I don’t think anyone has mentioned testing it with the instant brown rice. I just made this tonight and only had instant brown rice on hand and used a 9×13 pan. Did end up cooking (covered) much longer. Approximately 50 minutes, stirring every 10 minutes after the initial 20. There was A LOT of liquid, but seemed to start absorbing quickly the toward the end. Cooked uncovered for the recommend 10 minutes then let sit. Turned out very well, seconds were had. Great! Glad to know that it worked with the instant brown rice, too! Fantastic! I am trying to convert to “mostly” Mediterranean diet so the brown rice works. Has anyone tried to do this in the instant pot? Did you change the recipe when you updated in Nov 2018? I rechecked the recipe, instructions, and comments numerous times to figure out why I got such a poor result. Mine was dark brown, sticky, and very salty. I did forget the cup of chopped onions, but otherwise followed the recipe instructions. Is it correct to use one whole cup of low sodium soy sauce, and to bake at 425 for 55 minutes? Hey, Susan! The recipe was updated to use long grain white rice (rather than the original that called for instant rice), for two reasons: (1) I found that a lot of readers were asking how to adapt the recipe for regular rather than instant rice; and (2) I found that the regular rice gave a better texture in the end than the instant rice. 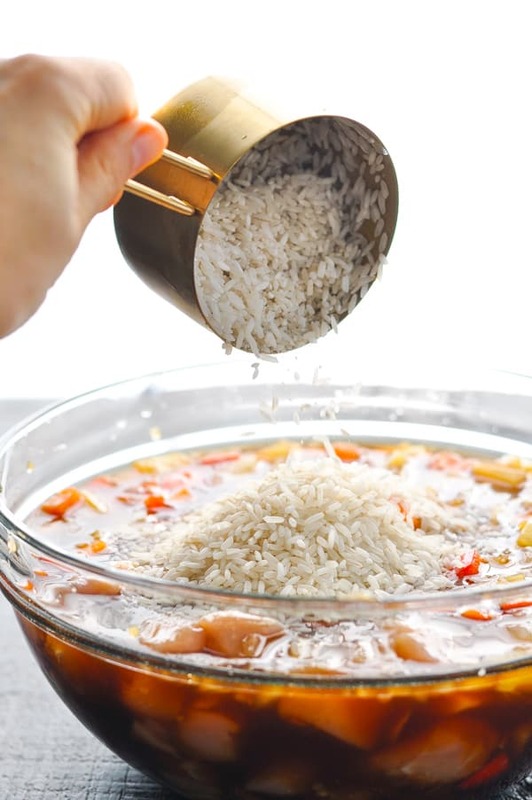 When adjusting for regular vs. instant rice, you also have to increase the amount of liquid that you use (because the regular rice absorbs more liquid as it cooks). So the updated recipe includes more soy sauce and more chicken broth. I’m not sure why your recipe came out sticky and dark brown — did it look like the dish in the photos? I can’t say what you did differently (if anything), but it should turn out as shown in the post if you follow those instructions. No, it didn’t look like the pictures, which is why I wondered if I had done something wrong. It looked pretty over cooked. I am cooking more rice to mix in, and will probably add more juice or water to make it saucier. Thanks for your help. Okay! I’m not sure what the difference may have been, but I hope that you can get it to work for you! I cooked this tonight and mine turned out the exact same way. IF I choose to make this again I will cut the soy sauce in half. I can tell it has potential but what I got tonight looked nothing like the picture and was way too salty!! Can i use instant rice as well? Hi, Jennifer! I’ve used instant rice in the past (with a different ratio of liquid because instant rice doesn’t absorb as much liquid), but I find that it doesn’t work as well — which is why I recommend the regular long grain rice here. 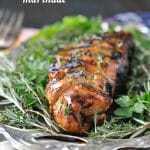 Is it possible to use frozen chicken breast tenderloin or should it be thawed out first? If possible without thawing, how much time should be added? Hi, Jenny! The problem with using frozen chicken is that it will require longer to cook — which will then likely result in overcooked rice. The timing is about the same for the thawed chicken and the white rice, which is why this works well. If you want to use frozen chicken, I would suggest using brown rice because the brown rice has a much longer cooking time than the white rice (and will therefore be done at about the same time as the chicken). Hope that helps! I made this last night for myself, husband and 3 25 year old guys. We all loved it. I was about 45 minutes into baking and remembered that I forgot to cover the pan with foil!! I really thought that I ruined the dish and was very upset. I took it out at that point, stirred it and the rice was almost cooked. I added about 1/2 cup more water, covered and put in for about 15 more minutes. It was still excellent! I skipped the bacon because I just didnt feel like cooking it and we didnt miss it. This will definitely be made again! Cant wait until my US Marine son comes home from Hawaii so I can make Aloha Chicken and rice for him! 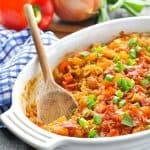 If I used brown rice in place of white, could I partially cook the brown rice ahead of time and then stir it in with the other ingredients listed in Step 2 and bake for the same time that is listed in the recipe? Hi, Willadale! If you pre-cook the brown rice, then it will not absorb as much liquid in the dish. As a result, you’ll need to decrease the amount of liquid in the recipe or you’ll end up with more of a “soupy” finished product. Wow! I made this last night and it was soo delicious! It was a perfect week night meal with no fuss, but full of flavor. I added cashews and it was yummy. Thank you! So only 1 cup of rice is needed for this recipe? Does that make plenty of rice for the dish? My daughter likes her veggies not ‘mushy’ when cooked. 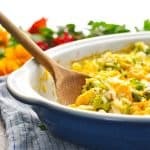 Any advise on adjusting the recipe so the veggies are not too soft. Recipe sounds great. Can’t wait to make it! bag of frozen Asian veggies. A healthy version in my opinion. Thanks, Catherine! Your changes sound great!